Create an atmosphere of royalty with our Princess pen set. Place on your guest book table to encourage guests to sign with their wishes of happiness. 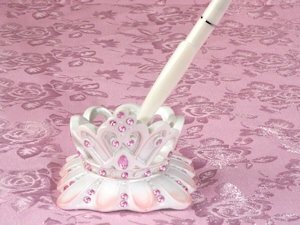 A resin tiara shaped base accented with pink crystal holds the included pen - a perfect addition to your wedding or sweet 16 party Each set comes gift boxed and measures 8" high.